Sorry I'm not to chatty today, haven't been feeling very well. The weather here is all over the place. One day cold and rainy, the next sunny and 65, but that's N. TX for you, just wait a few minutes and it will change again. 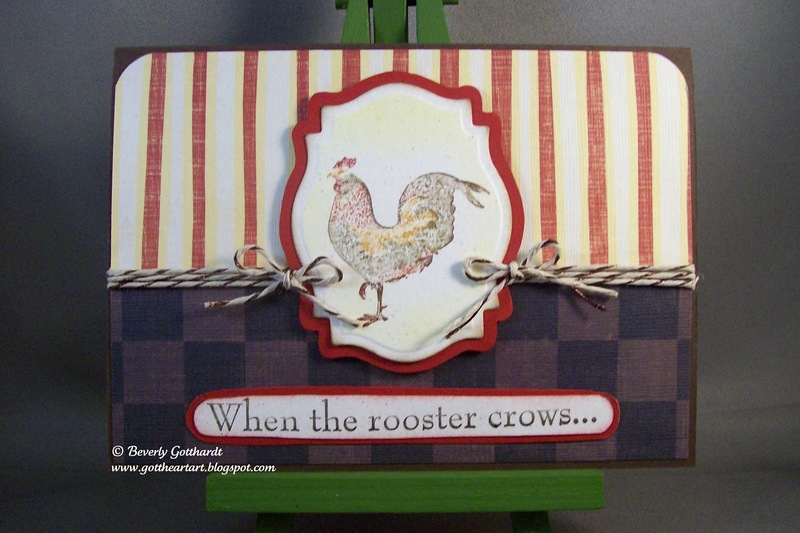 November was Down On The Farm at Gingersnap Creations, so for the color challenge I decided to keep the head Rooster the focus of this card today. 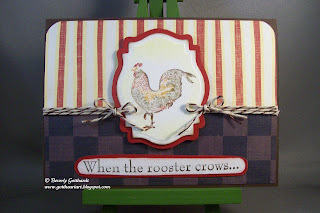 I tapped the markers on the stamp to get the mottled look, sponged some sunny yellow around the medallion because you know all roosters are up at dawn, and tied him down with some bakers twine that I found that has some sparkle to it (even though you may not be able to see that). Hope to get some more studio time later this evening.